کلائی, محمد جواد. (1397). A study of magnetic drift motion of particles around the equatorial plasmapause by using the cluster observation. مجله ژئوفیزیک ایران, 11(5), 55-61. محمد جواد کلائی. "A study of magnetic drift motion of particles around the equatorial plasmapause by using the cluster observation". مجله ژئوفیزیک ایران, 11, 5, 1397, 55-61. کلائی, محمد جواد. (1397). 'A study of magnetic drift motion of particles around the equatorial plasmapause by using the cluster observation', مجله ژئوفیزیک ایران, 11(5), pp. 55-61. کلائی, محمد جواد. A study of magnetic drift motion of particles around the equatorial plasmapause by using the cluster observation. مجله ژئوفیزیک ایران, 1397; 11(5): 55-61. On August 7, 2003 the Cluster spacecraft moved through the dayside magnetosphere. The energetic particle spectrometer on board Cluster provided measurements of an extensive range of energy. Besides, satellite measurements of geomagnetic field showed a gradient magnetic field. It is known that an inhomogeneity of the magnetic field leads to a drift of charged particles. In this paper, the drift velocities including gradient drift and curvature drift have been calculated for an energy range from 0.1 to 300 keV via various pitch angles (about 6 to 9 UT). The pitch angles in the magnetic equator via the magnetic mirror location have been calculated near the magnetopause. Besides, the ratio of perpendicular particle energy over total particle energy as a function of equatorial pitch angle has been calculated. The drift velocities depending on the pitch angle for the low energy (0.1 kev) is about 0.01-0.07 km/s and for the higher energies of the particles (300 kev) is about 50-200 km/s between L ≈ 4 to L ≈ 6. The results show that particles with higher energies penetrate the deeper areas of the magnetosphere. André, M., Li, K., and Eriksson, A. I., 2015, Outflow of low-energy ions and the solar cycle: Journal of Geophysics Research, Space Physics., 120, 1072–1085. Apatenkov, S. V., Sugakm T. M., Sergeev, V. A., Shukhtina, M. A., Nakamura, R., Baumjohann W., and Daly, P., 2009,Radial propagation velocity of energetic particle injections according to measurements on board the Clustersatellites:Cosmic Research,47(1), 22–28. Baunmjohann, W., and Treumann, R. A., 2012, Basic Space Plasma Physics: Imperial College Prees. Darrouzet, F., DeKeyser, J., De´cre´au, P. M. E., Lemaire, J. F., and Dunlop, M. W., 2006, Spatial gradients in the plasmasphere from Cluster: Geophysical Research Letters, 33, L08105. doi.10.1029/2006 GL025727. De Keyser, J., Darrouzet, F., Dunlop, M. W., and Décréau, P. M. E., 2007, Least-squares gradient calculation from multipoint observations of scalar and vector fields: Methodology and applications with cluster in the plasmasphere: Annals of Geophysics, 25, 971–987. Engwall, E., 2009, Survey of cold ionospheric outflows in the magnetotail: Annals of Geophysics, 27, 3185–201. Esmaeili, A., Kalaee, M. J., 2017, Double-cusp simulation during northward IMF using 3D PIC global code: Astrophysics and Space Science, 362:125, DOI 10.1007/s10509-017-3098-8. Kalaee, M. J., and Katoh, Y., 2016, The role of deviation of magnetic field direction on the beaming angle: Extending of beaming angle theory: Journal of Atmospheric and Solar-Terrestrial Physics, 142, 35–42. Korth, A., and Friedel, R. H. W, 1997, Dynamics`of energetic ions and electrons between L = 2.5 and L = 7 during magnetic storms: Journal of Geophysics Research, 102, 14113. Vogiatzis, I. I., Fritz, T. A., Zong, Q. G., and Sarris, E. T., 2006, Two distinct energetic electron populations of different origin in the Earth’s magnetotail: A Cluster case study: Annals of Geophysics, 24, 1931–1948. Wilken, B., Axford. W. I., Daglis, I., Daly, P., and Guttler, W., 1997, RAPID: The Imaging Energetic Particle Spectrometer on Cluster: Space Science Review, 79, 399–473. 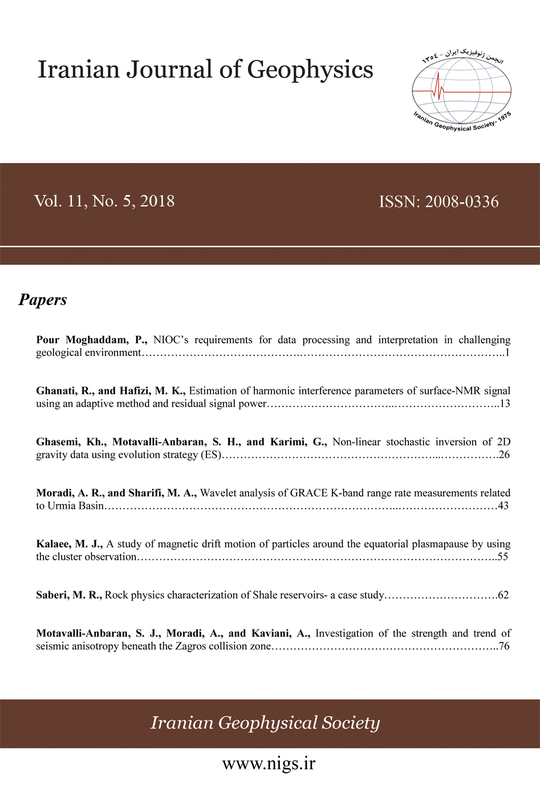 Wilken, B., Daly, P. W., Mall, U., Aarsnes, K., and Baker., D. N., 2001,, First Results from the RAPID Imaging Energetic Particle Spectrometer on Board Cluster: Annals of Geophysics, 1355–1366.